Doughty Street, Bloomsbury home of the Charles Dickens Museum, becomes John Street a little further south. 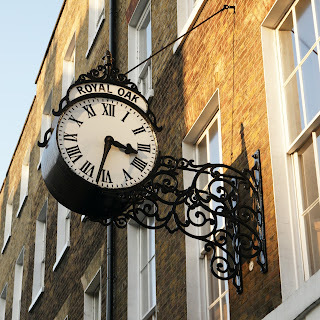 Sticking out from one of the terraced buildings is a rather fancy clock, atop which are the words Royal Oak. That rather puzzled me: the name suggested a pub, but the building certainly did not. The answer is that the clock marks not a former public house but a now-defunct Benefit Society. Founded in 1837, the Royal Oak Benefit Society moved to John Street by 1907 and settled there for a half-century. Members effectively insured themselves against sickness and unemployment, receiving benefits when they were unable to work. Further reading: more public clocks in York, Cambridge, Chichester, and London (Soho, Lewisham, Guildford, Victoria and Bell Yard). Horology enthusiasts will also enjoy Clock This, a blog devoted to public clocks in London. 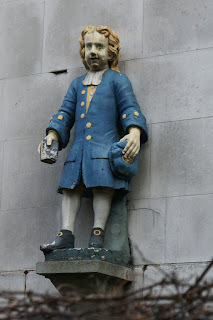 I've posted on several occasions about the figures of schoolgirls and boys placed above the school entrance. They served not only to advertise the educational premises but also to model the school uniform - a real attraction for poor families who could not usually afford such clothes for their children. As saints had their attributes, so the schoolchildren carry their books. The girl also holds a book or parchment in her left hand with the date of the school's foundation, 1696. (The figures themselves are probably eighteenth-century.) 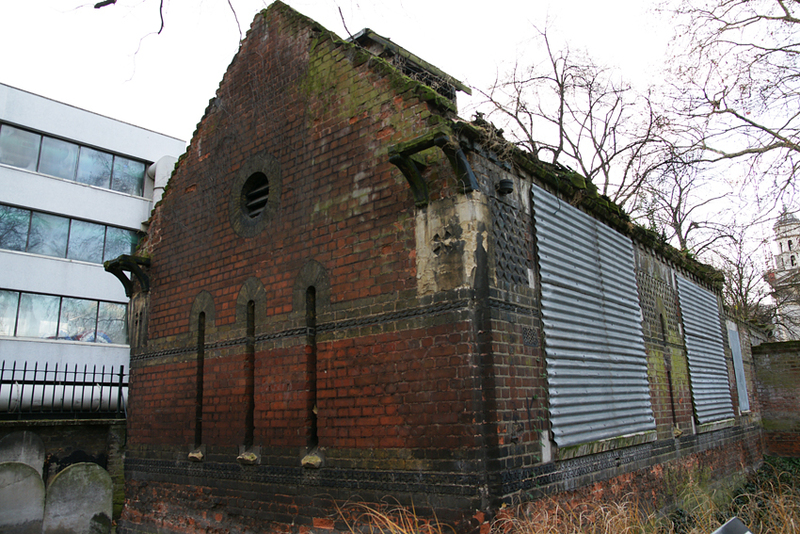 It was St Andrew's Parochial School, originally located in Brook Market. 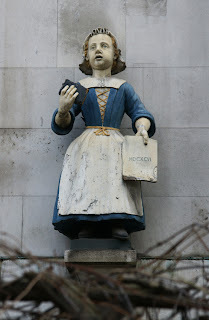 After it moved to Hatton Garden, she and her friend took up their posts at the Cross Street entrance. Another pair still watch over the main entrance but these two were moved after the Second World War to the facade of St Andrew's Church. Further reading: figures in Wapping, Rotherhithe and Hatton Garden. 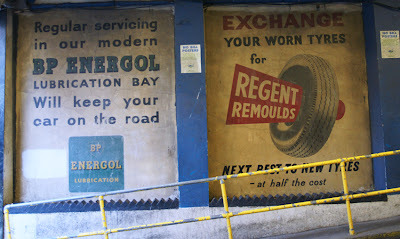 This fine sign in Red Lion Court, one of the alleyways off Fleet Street. 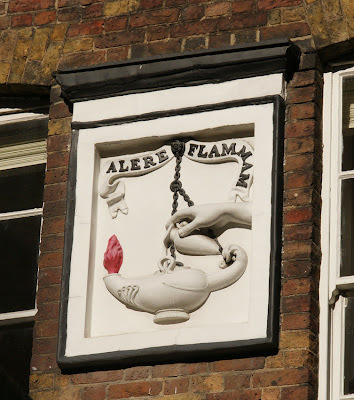 Alere flammam means 'feed the flame', and the hand in the image is doing just that. 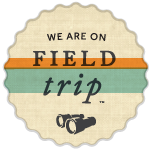 It was the sign of printer Abraham Valpy, who worked here until his retirement in 1837. Valpy was a schoolmaster's son, who studied first at his father's school (Reading Grammar School) and then at Oxford University. His first publication was a selection of excerpts from Cicero's letters - in 1804, when he was only 14 - so after leaving Oxford he was apprenticed to bookseller Humphrey Pridden so that he could be admitted to the Stationers' Company. 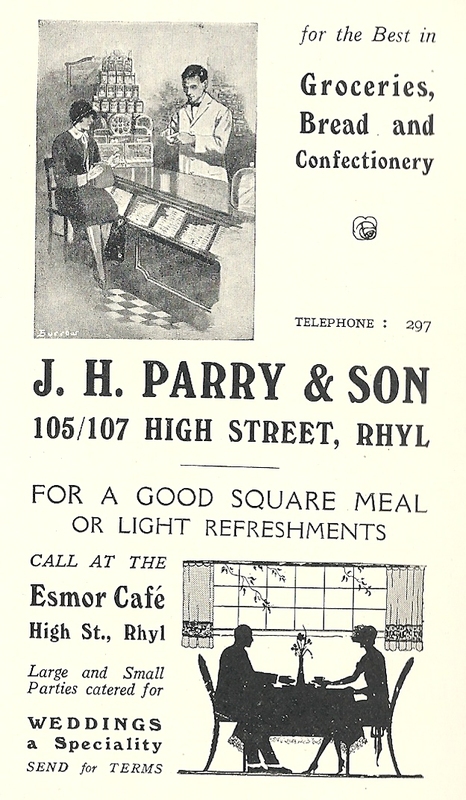 Valpy opened his first business in Took's Court but moved to these premises in 1822. Valpy specialised in classical literature, and went on to found the Classical Journal. Other periodicals included The Pamphleteer, an anthology of contemporary pamphlets, and The Museum. However, the classics remained his main interest: he published both learned editions and the translated Family Classical Library. The sign he chose, then, was as apt in its illustration of a Roman lamp as in its motto: he did indeed 'feed the flame' of learning. We may think of the Victorian age as a politer time, when greetings cards featured sweet children, cute kittens, lacy borders and the language of flowers. 'Vinegar valentines', with their crude caricatures and cruel 'humour', tell a different story. I fear you catch not lover's heart. I wish your mouth would really screech less. Was out of town when you were made. The cards might target particular occupations, or be directed at personal characteristics of the recipient. Add an inexpensive stamp and the anonymity central to the valentine's tradition, and a cruel insult could be sent with little effort or risk of detection. Unsurprisingly, such cards were often not kept or recorded by their recipients. 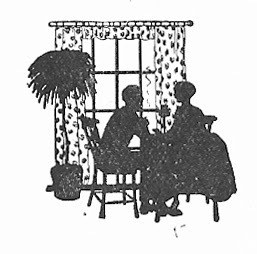 As a result, although it is known that about half of valentines' cards in the mid-century USA were 'vinegar', we don't know if the same proportions applied in Britain. The cards were unpopular with many commentators, who found them vulgar, unpleasant and morally damaging. It would take a drastic decline in the popularity of all valentine's cards in the early twentieth century, though, for the genre to disappear. When the giving of love tokens revived in popularity, this unpleasant counterpart remained in thankful obscurity. Further reading: Annebella Pollen, Love Letters and Hate Mail. Norfolk Museums have several examples. 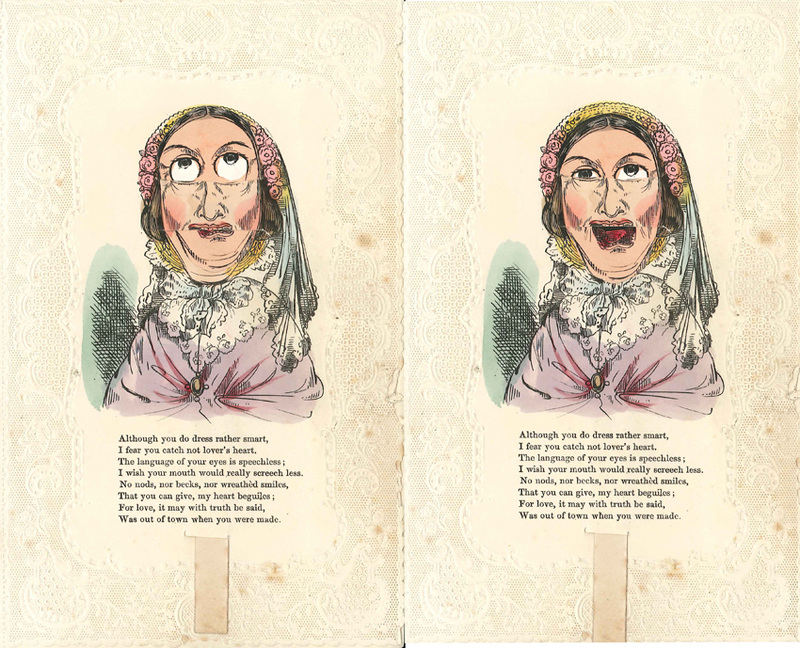 Read about the Museum of London's collection of valentine's cards, including novelty and vinegar examples, here and explore it here. With the extravagant Royal Courts of Justice in the background, this lampstand would always have to be elaborate to compete. 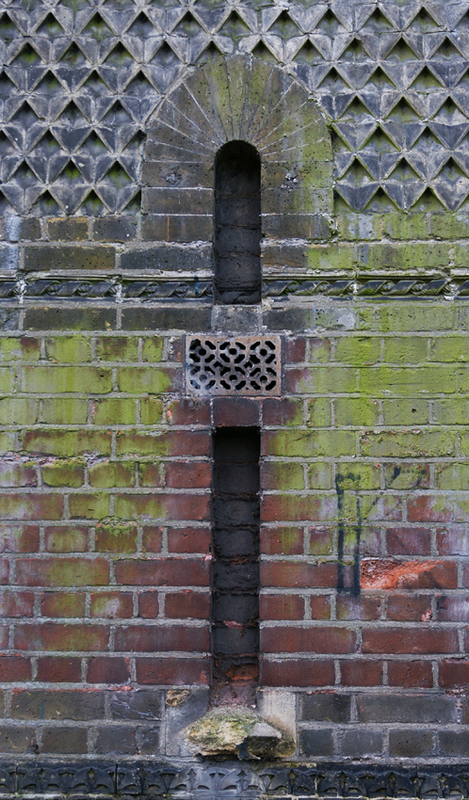 However, there's a reason behind some of the ornamentation: it incorporates ventilation for the public toilets below. The lampstand was made by Walter Macfarlane & Co of Glasgow, responsible for much of Britain's Victorian ironwork. This design was an adapted 'lamp pillar no. 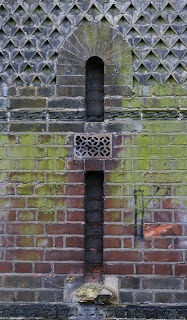 5': the standard design, as once visible in Holborn, had neither vents nor buttressing. 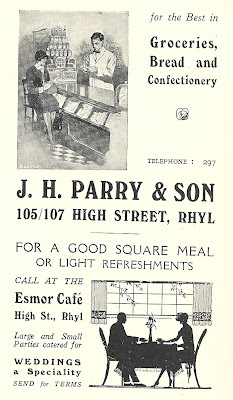 Rhyl's establishments showed particular foresight in offering not only restaurant meals but also provisions for a picnic. These may offer an idealised glimpse of a lost and privileged lifestyle, but all the same, an invitation to 'lunch at Lauder's' remains appealing today. The former mortuary in the churchyard of St George's in the East became the Borough of Stepney Nature Study Museum in 1904. 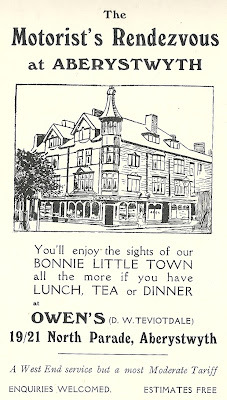 It was largely the work of curate Claude Hinscliffe (who would later found the Church League for Women's Suffrage with his wife), while the cost of £253 1s 2d was paid by an anonymous benefactor. 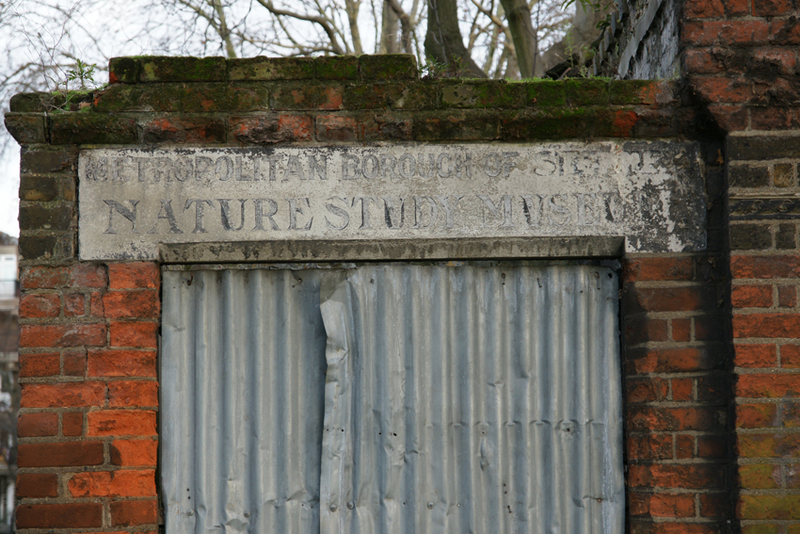 The superintendence of the garden is left to Miss Kate Hall, who takes charge of the Borough of Stepney Museum in Whitechapel Road, and also of the charming little nature-study museum in the St. George's Churchyard Garden. What formerly was the mortuary has been turned to good account, and hundreds of children in the borough benefit by Miss Hall's instruction. Aquaria both for fresh-water fish and shells, and salt-water collections, with a lobster, starfish, sea anemones, and growing sea weeds are to be seen, and moths, butterflies, dragon-flies, pass through all their stages, while toads, frogs, and salamanders and such-like are a great delight. The hedgehog spends his summer in the garden, and hibernates comfortably in the museum. The bees at work in the glass hive are another source of instruction. Outside the museum a special plot is tended by the pupils, who are allowed in turn to work, dig, and prune, and who obtain, under the eye of their sympathetic teacher, most creditable results. However, not all the 'exhibits' were well-behaved. The Borough Librarian complained in 1937 that the Museum's monkey had bitten staff and public alike! During World War II, many of the local children were evacuated from London and the museum closed. It has never reopened, and today the building looks sad and derelict. It is on English Heritage's Buildings at Risk register, although there are hopes that a new use for it will soon be found. Sponsored by Dunlop, Reginald Wellbye's Picturesque Touring Areas in the British Isles has pages of advertisements clearly aimed at motorists. 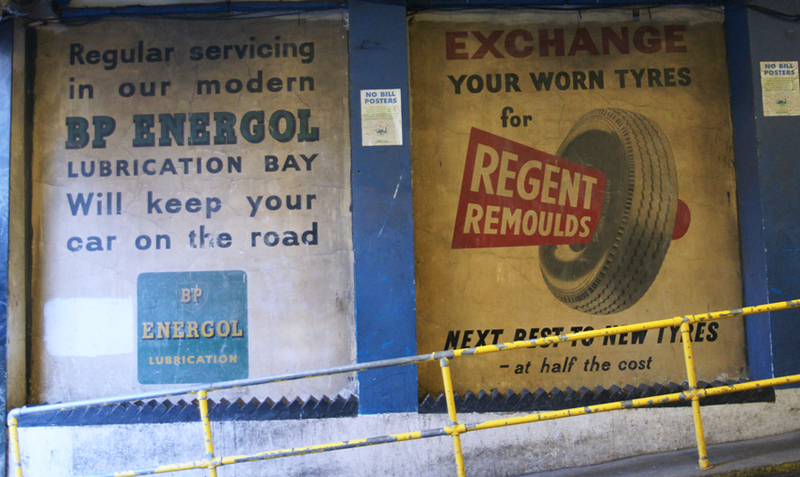 Many are for garages, who invite car-owners to drive in for repairs; breakdown recoveries are not mentioned. However, all have telegraph addresses and some have surprising amounts of parking with garages for 75, 100 or even 200 cars. 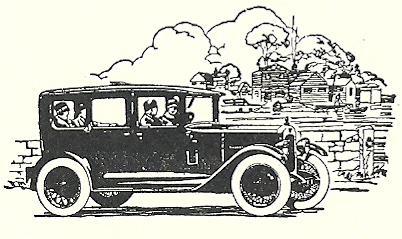 The images of cars are wonderful, with external spare wheels, running boards and split windscreens. 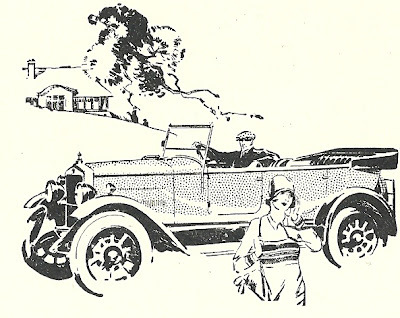 Some advertisments go further, emphasising what car ownership could mean: access to countryside and touring holidays. The 20mph speed limit was abolished this year, while a Ford Tudor dealer claimed it 'finds the Prettiest Places' thanks to shock absorbers and sturdy construction able to withstand 'rough uncertain roads'. 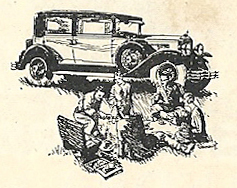 Thus a visual narrative was apparent: small groups of friends exploring scenic Britain, a world of picnics and the picturesque. They were unbothered by fellow tourists or locals (presumably a considerable contrast to the charabanc experience) as they enjoyed both sunshine and freedom. 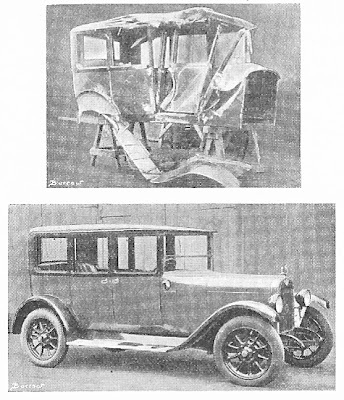 The repairs which dominated the text around these pictures never troubled the travellers within them. A jarring contrast is offered, then, by the advertisement for J Gairn & Co of Edinburgh. They use a photograph rather than an idealised line drawing, and actually show in vivid detail the damaged bodywork which they specialise in repairing. Tucked among the tempting images of other advertisers, this picture must have been an unwelcome reminder of reality for many readers. 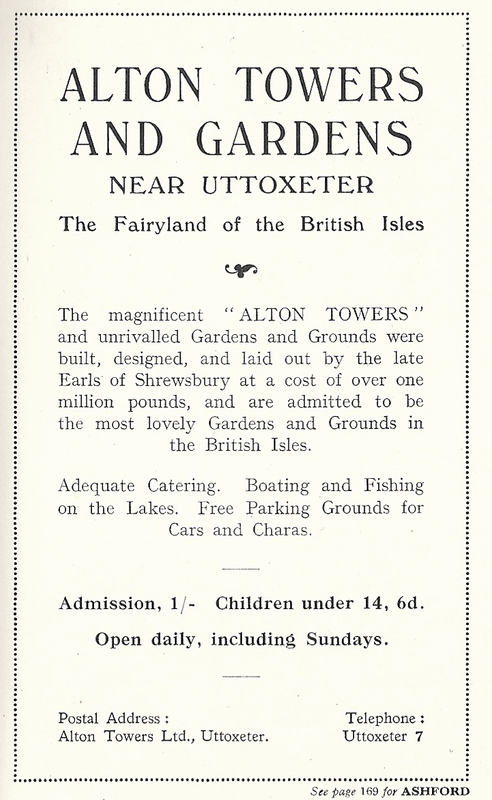 Alton Towers was the home of the Earls of Shrewsbury from the 15th century. It underwent a major transformation when the 15th Earl, Charles Talbot, employed garden architects Thomas Allason and Robert Abrahams to transform the grounds. Fountains and conservatories were built: the Chinese Pagoda Fountain was a replica of the To Ho Pagoda in Canton. Guests could take refreshments in Le Refuge, while a blind harpist lived in a thatched cottage and would play so that music completed the effect. The Earl died in 1827; his nephew succeeded him and continued to improve the gardens. 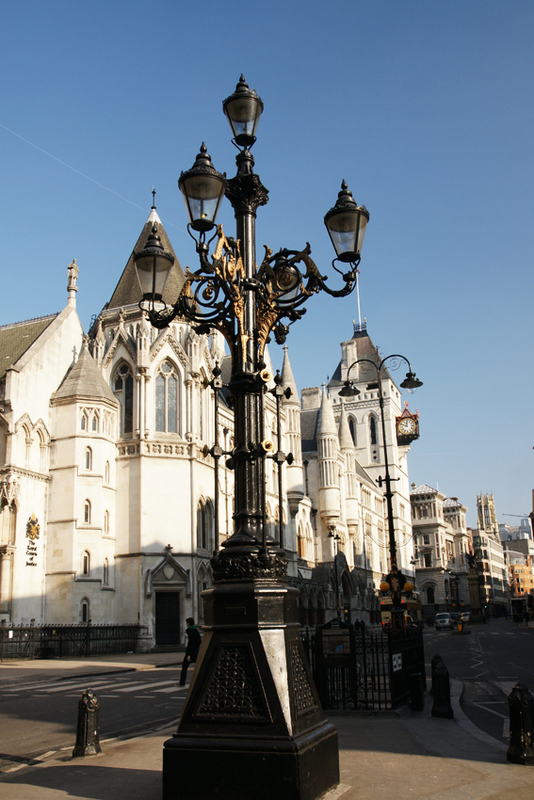 The public were first admitted in 1860, when the 18th Earl wanted money for refurbishments. Thirty years later, fetes attracted tens of thousands of visitors. 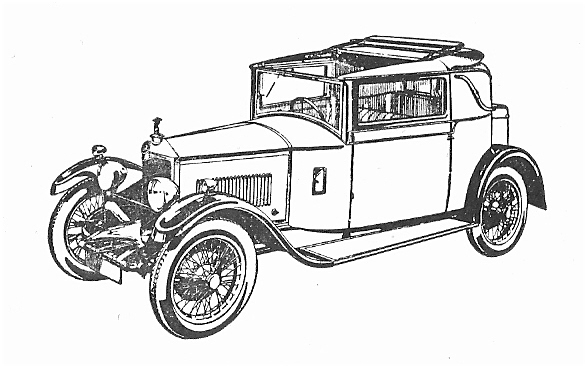 When the 20th Earl and his wife separated, she stayed in Alton Towers while he moved to Ingestre and founded the Talbot Car Company. 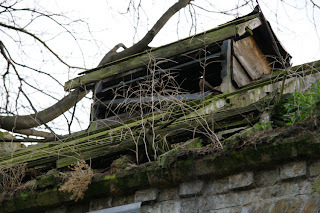 With little spent on its upkeep, the estate was neglected. 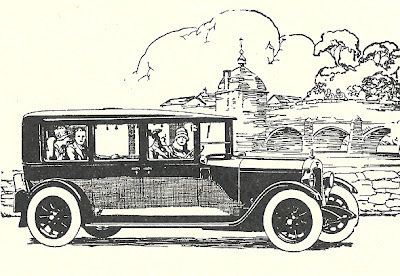 Its fortunes revived again in 1924, however, when it was bought by a consortium of businessmen who opened it to the public. This was at the expense of the house, however, which declined once fittings were removed and is now partly in ruins. 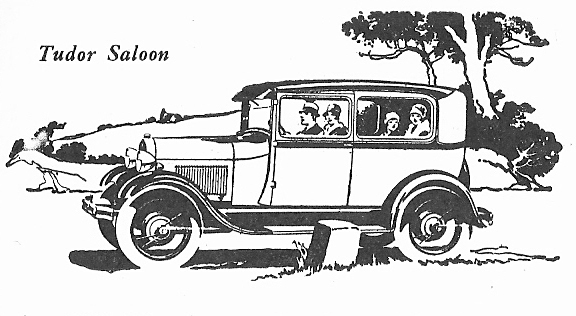 The attraction was a great success, with visitors flocking by rail, motorcar and charabanc. 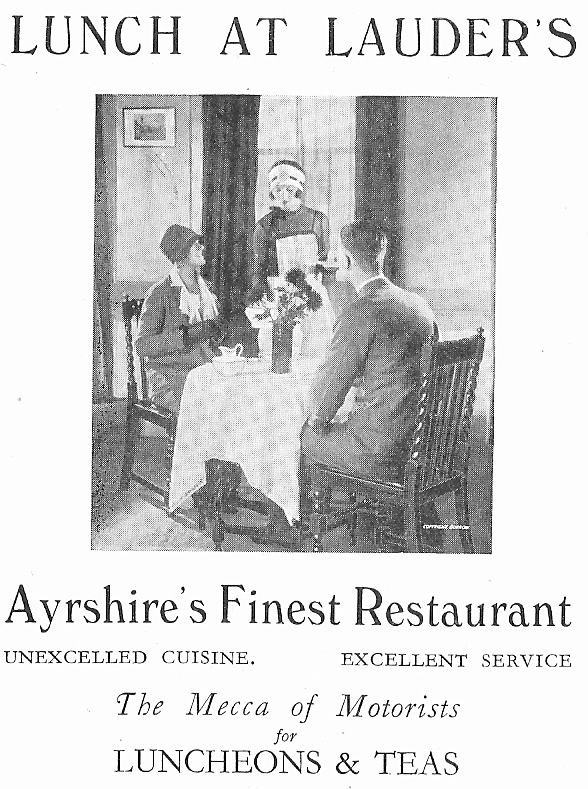 In 1930, the year the advertisement above appeared, Pathe News also visited. World War II interrupted, with the property requisitioned by the War Office. 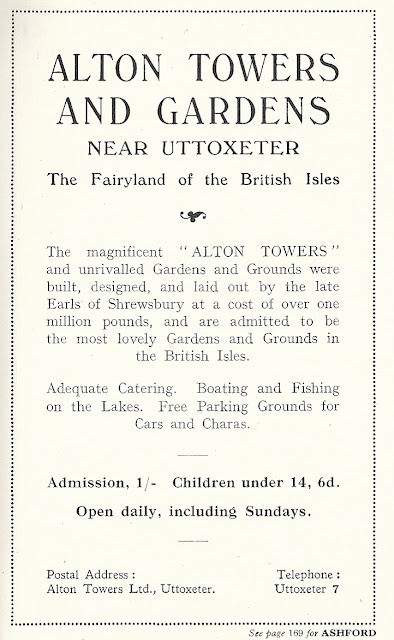 When the gardens reopened in the 1950s, small fairs in the grounds helped to attract visitors; gradually, more rides were installed so that today Alton Towers is associated with rollercoasters and thrill rides. The gardens, though, have survived throughout and can still be visited.